We are leading Suppliers and Distributors of Current Calibrator. Displays : There are three LCD displays Main, Second and Third. The Main and second displays are 4½ digit with maximum reading of 19999. The main displays the value of T1, T2 or output setting. The second displays T1 or T2 readings and the third T1-T2 and groups settings. 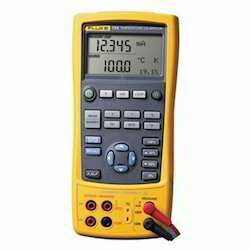 KM CAL 903 is a Source & measure Calibrator. It gives output of 400 Ohms, (it has high accuracy of 0.05% and works on 9V alkaline battery. Thermo resistance PT 100 & Cu 50), and 5 digits LCD display.